Sponge scourers are suitable for cleaning most types of surface. Perfect for use in kitchens due to their absorbent and abrasive properties. 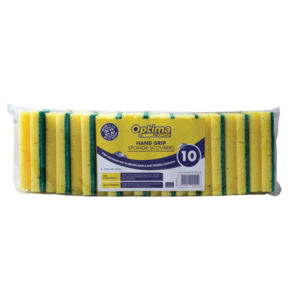 We offer a wide range of sponge scourers which are ideal for both professional and domestic use. These scourers are shaped with a handgrip to allow optimum comfort for the user. The absorbent sponge is ideal for mopping spills whilst the abrasive fibre is perfect for those tough stains. Our absorbent Optima proclean sponge is ideal for the removal of stubborn marks. The sponge is ideal for mopping spills and also cleaning surfaces whilst the abrasive fibre is perfect for removing tough stains. 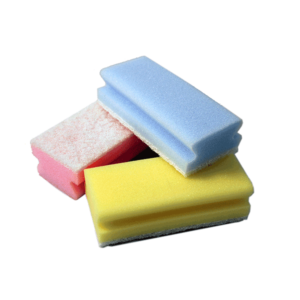 Colour Coded Sponge Scourers are suitable for any cleaning regime as they are colour coded to minimise the risk of cross contamination. These scourers are shaped with a handgrip to allow optimum comfort for the user and will clean without scratching making them ideal for cookware, ceramics, worktops ,plastics etc. 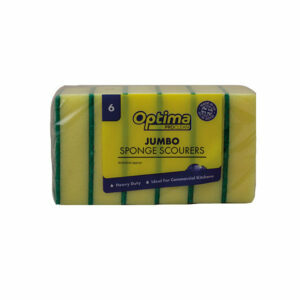 Perfectly suited for a professional kitchen environment are the optima jumbo sponge scourers. Large surface area increases productivity as well as saving both time and money. The absorbent sponge is ideal for mopping spills and cleaning surfaces coupled with the abrasive fibre which is perfect for removing tough stains. 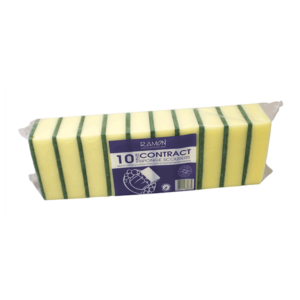 Ideal for commercial kitchens or domestic alike, this good quality and highly absorbent sponge allows the user to clean dishes and wipe up spills with ease.